Practice improves your sales skills in a fun new way. 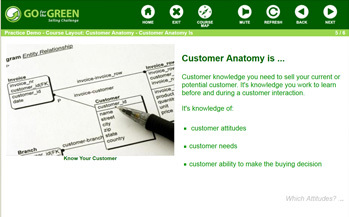 You learn and improve 9 key sales skills on your laptop or desktop to sell more. The learning’s challenging … and compared to golf so it’s always fun. Check out Play. See how to test and score your skills. 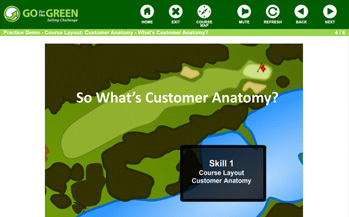 Go for the Green Selling Challenge brings sales training to your fingertips. 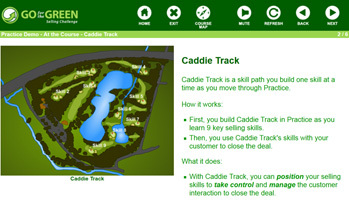 The interactive environment and golf theme engage its students through passive and active learning. As an e-learning author, I can say with confidence that this training course embodies best practices and trends in the field, and its web-based delivery makes it accessible to anyone, anywhere. If you’re looking for a one-stop-shop for sales training for new employees, Go for the Green Selling Challenge could be your solution! Luke Benfield, Senior Instructional Designer at naviHealth, Inc. I love the format, the golf connection and the material which is well thought out sales strategy. 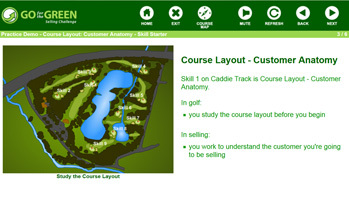 I had the pleasure of working with Peter early on in his fascinating endeavor to create an innovative web-based learning product for selling skills using a golf analogy. 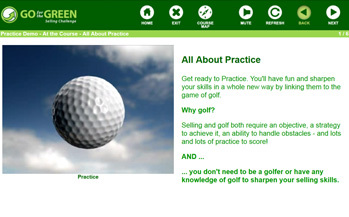 We both seemed to gravitate towards our one similar passion: golf which for Peter morphed into Go for the Green Selling Challenge. This innovative web-based platform provides a fundamentally strong skills-based, executive sales development training program with tangible ROI results for the sales and business executive. 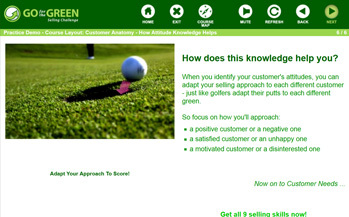 Go for the Green showed me how I can promote positive personal relationships with my customers, which is important to me as a PGA Pro. It helped me see how I can educate my customers about my products and how to match product benefits to my customer’s needs. Learning more about decision makers was very helpful for me.